NASA's Curiosity rover on Mars is busily grinding out science data — and has likely relayed some provocative findings — but mum's the word from scientists on the mission. At the epicenter of all the speculation is that Curiosity's Sample Analysis at Mars (SAM) instrument has gulped in Martian soil and regurgitated exciting news. John Grotzinger, lead mission investigator for the Curiosity rover, set the rumors in motion during an interview with NPR last week, saying, "We're getting data from SAM … this data is gonna be one for the history books. It's looking really good." Whatever history-making news there is to report, Curiosity scientists are expected to cough up the goods at this year's American Geophysical Union (AGU) meeting in San Francisco, to be held from Dec. 3 to Dec. 7. On the AGU agenda is a discussion of Curiosity's search for organic molecules on Mars with its Gas Chromatograph-Mass Spectrometer — a key instrument to help explore the surface and subsurface of Mars, seeking traces of prebiotic or biological activity. Camera onboard Curiosity shows the covers in place over two sample inlet funnels of the rover's Sample Analysis at Mars (SAM) instrument suite. Curiosity delivered SAM's first soil sample on the day this image was taken, the 93rd Martian day, or sol, of the mission (Nov. 9). 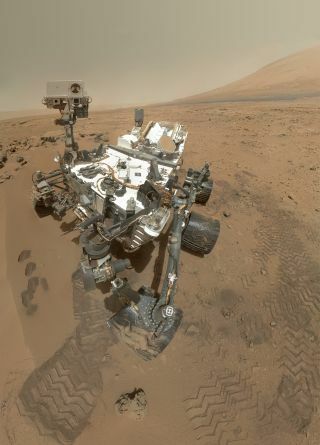 Most scientists contacted by SPACE.com believe that Curiosity's SAM has detected organic chemical compounds. Still, some experts caution that the rover's finding may be overhyped. SAM results as 'earthshaking' is, in my view, an unfortunate exaggeration. We have not (yet) found anything in SAM that was not already known from previous missions: Phoenix and Viking." But James Garvin, chief scientistat NASA's Goddard Space Flight Center in Greenbelt, Md., and a member of Curiosity's Mars Science Laboratory (MSL) science team, had a different take. "What John Grotzinger was saying as our very capable project scientist on MSL is exactly the case," Garvin said. "The analytical payload on MSL —in particular, SAM as a suite —has been making unprecedented measurements of solid material samples with incredible implications about Mars, but which require, as in all science, demonstration of reproducibility and adequacy of calibration/validation." Curiosity landed inside Mars' huge Gale Crater on Aug. 5, beginning a two-year mission to determine if the Red Planet could ever have hosted microbial life. The rover carries 10 different instruments, but SAM is the heart of Curiosity, taking up more than half of its science payload by weight. Garvin said the SAM team, plus the wider MSL science team (including Grotzinger), "are working industriously to have consistent results for the world to revel in as soon as possible." "It is more akin to waiting for test results from one's doctor … we want to be sure they are valid and properly interpreted and explained," Garvin added. Unlike imaging and related experiments, highly sensitive results from SAM's instruments, which include mass spectrometers, tunable diode laser spectrometers and gas chromatographs —require very great care in calibration, validation and interpretation, Garvin emphasized. "MSL with its Curiosity rover really is analogous to the Hubble Space Telescope in the impact it can and will have —we just have to be patient," Garvin said. Similar to the Hubble Space Telescope, Garvin added, "We have to be patient to use our tools to look at the 'right stuff.' Stay tuned … Mars will not disappoint and nor will MSL." Also awaiting the word from the Curiosity science team is Michael Mumma, a planetary scientist also at NASA Goddard, where he is founding director of the Goddard Center for Astrobiology. "It clearly relates to the first soil sample analyzed by SAM. I suspect the delay means that a second sample is being analyzed to confirm findings from the first," Mumma said. "Remember that TLS will sample gas —water, methane —from pyrolyzed soil, while SAM's GCMS [Viking Gas Chromatograph-mass Spectrometer]samples the mass spectrum," Mumma said. Bite-marks on Mars. NASA’s Mars rover Curiosity used a mechanism on its robotic arm to dig up five scoopfuls of material from a patch of dusty sand called “Rocknest.” Each of the pits is about 2 inches (5 centimeters) wide. A sample from that fifth scoop was analyzed by Curiosity’s Sample Analysis at Mars (SAM) suite of instruments inside the rover. A second sample from the same scoopful of material was delivered to SAM for analysis on Sol 96 (Nov. 12). In Mumma's view, "blockbuster findings" could include the discovery of a major release of methane from pyrolyzed soil, with measurements of certain intriguing chemical variations called isotopologues. A finding of complex hydrocarbons (molecules containing hydrogen and carbon) or of a type of chemical compound called polymers, would also be a major discovery. "I think the minimum finding that could get Grotzinger to describe it as 'historic' is complex organic compounds," said Gilbert Levin, an adjunct professor at Arizona State University in Tempe. Levin was a life-detection experimenter on NASA's Viking mission to Mars in 1976. Levin and co-experimenter Patricia Ann Straat led the Viking Labeled Release (LR) investigation, which returned data from Mars indicating the presence of microbial life, the team asserts. "I have already pointed out that the Viking PR [The Viking biology package also consisted of the Pyrolytic Release experiment (PR)] showed that simple organics are continually being formed on Mars, so they would be no big deal for Curiosity," Levin told SPACE.com. "I doubt SAM could have detected proof of living microorganisms. But, slowly, ineluctably, NASA is being dragged into the mire of life on Mars, and will ultimately, maybe soon, have to reverse its opinion on the results of the Viking LR." If Curiosity has found organics, Levin said, it will thereby confirm that the GCMSwas not sensitive enough to rule out the positive findings of the Viking LR. "The failure of the Viking GCMS is the only remaining obstacle to acceptance of the Mars LR having detected existing microbial life. That obstacle would be removed by the Curiosity finding of organics. Whether that will turn the consensus in favor of life, I do not know, but any rationale against it would be difficult to maintain," Levin concluded. Ultimately, the world will have to wait just a little bit longer to find out what Curiosity knows. "Curiosity's science team is analyzing data from SAM's soil inspection, but not ready to discuss yet," said Guy Webster, a spokesman for the Curiosity Mars rover science team at the Jet Propulsion Laboratory in Pasadena, Calif. This is no change from the policy with past results from the mission, such as SAM's atmosphere analysis or CheMin's soil sample analysis, Webster told SPACE.com. "The scientists want to gain confidence in the findings before taking them outside of the science team." Webster said that Grotzinger was delighted about the quality and range of information coming in from SAM and similarly delighted by results at other points during the mission so far. "The characterization of new findings as earthshaking did not come from anyone on the mission's science team," Webster said.